Ok, but how do you apply letters to something like mechanics and not only electronics? What if electronics, mechanics AND aesthetics are involved? I still prefer to see how open a certain project is. Like what i suggested in my post in the other topic. With a good system that directly covers the content, and therefore it does the same (plus more!) than just using letters. You automatically know with a certain rating is about and if it's usable and what is usable. Scores and numbers can being put in perspective, letters not. I'm well aware the problem already exists, otherwise the topic wouldn't have come up. However I believe it's naive to think that companies or individuals who are prepared to steal a logo they're not entitled to would respond positively to legitimisation of the theft, by giving them a plethora of other logos to use. This situation arose because the OSHW association don't have the money to defend their logo, and unless that changes the less scrupulous will continue to use whatever they think will make them the most money. Those people wouldn't have the money to defend their logo anyway, OSHW or not. There is an M in the proposal for a reason, it stands for Mechanical. Ok, so what's your solution to the problem? Just a M is not enough of course. Most mechincal projects have a lot of steps, blueprints, drawings etc. Some projects also contain even software. I've had no other people say my suggested categories aren't enough. What's your suggestion? How many more letters do you want? So just by the fact that other people don't say anything about it, means it's good enough??? That's a new way of working to me. I'm thinking of suggestions, but the least I can tell you that for now a lot of people will be stuck. The reason why I am pointing it out, is because it's an issue. I'm not so sure there is one. You're approaching the problem as an engineer, which is no bad thing, but the people who have misappropriated the logo aren't acting as engineers, they're acting as marketers. Whatever you do they can't be trusted to stick to rules if they see gain from breaking them without consequences. 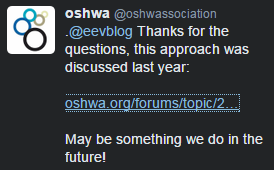 The OSHW association disagree, as would most closely involved in the OSHW industry. Yep. You are assuming that all people who use the logo inappropriately are doing so for marketing reasons. This is demonstrably untrue. And even for those that are, my solution provides a better way for the to so so legitimately. That's how these essentially crowd sourced and crowd legitimised ideas generally work. If my categories were wildly wrong (either too many, too few, or inappropriate) then believe me, people would be jumping up and down about it. So obviously my categories are close enough to be workable. Then please explain in detail. Who is going to be stuck? Why isn't anyone else pointing out the same problem you think there is? Even if some people are "stuck", no matter how many more categories you make, you won't be able to cover every possible scenario. It's going to be diminishing returns. There are hundreds of people telling me my font is wrong etc, it need to look this way and that way etc, or the entire concept is wrong/won't work etc, but I currently count only one person who has said the categories don't cut the mustard. Remove parts of my code from oshwlogo.js or switch the license to GNU GPLv3 (the one I used). I was a bit overwhelmed at work, I'll try to publish a new version today with text under logo option. Unfortunately, that is always going to happen. I've even thrown in a couple of thoughts ... but I realise they aren't really worth jumping up on a soapbox. I support what Dave has presented. Which parts? I didn't use your code actually, I used parts of https://github.com/derrickpelletier/react-download-svg which is MIT licensed. If you're seeing parts of your code in mine, which branch on github are you looking at? If it's the gh-pages branch, that code is minified and autogenerated. If it's the master branch then you'll see that I didn't copy any of your code, even the font's different. Therein lies the root of the current problem. why using another font, like Arial Black? OSHW already picked a font. What does the German one look like? And what was "F" again? But just to give another example. Let's assume I am developing a bench power supply. Including chassis, buttons, display, the whole thing. - Esthetics (the way the GUI looks like, logos, menu structure, design of the case etc). First software, can be closed source or open source, and being made with open source tools or not, can have closed source plugins. Second, electronics. Parts of the board can be shared, or completely. Can be drawn and in made in closed source or open source. BOM may be shared or not. Third, mechanics. Maybe these files are made in Solid Works, thermal analyses is done in Mathlab or everything is done in CoCreate. BOM can be shared or not. Maybe CNC files are needed etc. Last, esthetics. Design can be made in open source software or something like illustrator. Design files are maybe not shared or only shared for printing/showing or what's needed for CNC. Conclusion, with the letters we are having now, there is absolutely no way I can use it at all! So therefore it's extremely limited and in my opinion just not usable. Especially if a project has a combination of open source and non-open source tools and programs. Maybe someone can explain to me which letter I need to use if electronics BOM is shared, mechanics is not, and esthetics partly. Plus firmware is shared, made in open source software, but contain closed source plugins. Esthetics, which is part of the firmware, is not shared. So people can't change the menu structure and symbols. Schematics of the electronics are shared, but the 'schematics' (= building instructions) of the case isn't. I am sorry, but for me it's just way to vague to put it all into 'CAD/Mechanical files'. A lot of things are interconnected. Same for bill of materials or design documents. Besides, it is very easy to mix up capital letters with small letters. (BTW, in the logo generator the 'bottom of logo' option isn't completely working. So what do you think of the current situation, then? I wouldn't be too worried about the suggested letters seeming to be limited ... they offer a far finer resolution. There just has to be an adjustment in thinking, to allocate the project aspects being represented to the appropriate category letter. "I’ve been working in international standardisation for 20 years. There is no forum that I know of where they successfully had a convergent discussion on a definition of open. Don’t waste your/our time."